The story of Dr. Pepper is one of the greatest stories in the history of American business that almost never gets discussed. The founder of the beverage, Charles C. Alderton, actually beat Coca-Cola to the punch—obtaining a patent for Dr. Pepper’s formula in 1885 while John Pemberton didn’t start swirling Coca-Cola in Atlanta until 1886, making Dr. Pepper the oldest carbonated beverage in the world. The company had drugstore roots. Alderton was a pharmacist in Waco, Texas who worked for a sole proprietor named Wade Morrison at “Morrison’s Corner Drug Store.” The invention of the soda foundation was losing its novelty because everything was flavored vanilla which did not mix well in the Texas heat in a world before air conditioning—either the vanilla sodas would be warm, or they’d be loaded with ice and the sodas would taste flat as the ice melted. 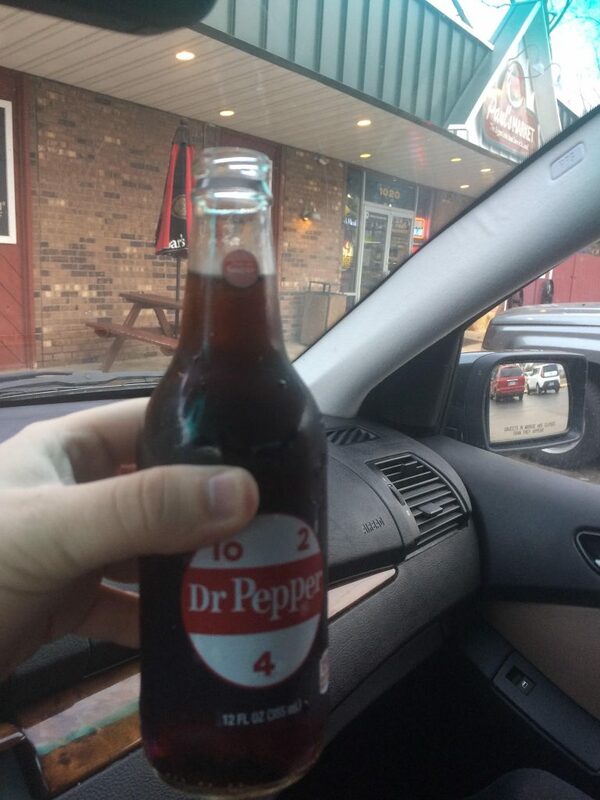 For inspiration in writing this article, I dragged to my dad’s childhood grocery store “Paul’s Market” in Ferguson, MO to get my hands a glass bottle of Dr. Pepper–one of only twenty-eight locations in the entire State of Missouri where Dr. Pepper is sold in a glass. You can see the “10-2-4” old-timey advertising on it, as Dr. Pepper suggested that customers could use the caffein hit at 10 AM, 2 PM, and 4 PM. Glass and real sugar dramatically turns drinking Dr. Pepper into a formal event. By adding a cocktail of chemicals and other ingredients that get people hooked–sugar, caramel coloring, caffeine, aspartame, and phenylalanine—Alderton was able to create a product tasted so good the McLennan County locals would come into Morrison’s and say, “Shoot me a Waco!” because of the high you get from ingesting caffeine and sugar simultaneously (a phrase even more appropriate now that we know sugar and caffeine can trigger the same parts of the brain that cocaine does). As is true with Coca-Cola, Pepsi, and all other cola products, the profit margins on Alderton’s invention earned mouth-watering returns between 25-40% (the extreme variance depends on whether the source is fountain, can or bottle). Within six years, lines would build up outside of Morrison’s clamoring for Wacos. This should have made Alderton obscenely rich, but it did not—he sold his invention to a Wade Morrison and another pharmacist named Robert Lazenby because he wanted to focus on being a pharmacist. It would be accurate to say that this decision cost Alderton, his wife, his children, and all subsequent heirs billions of dollars—by the end of Alderton’s life, Dr. Pepper’s market cap was $500 million, and if somehow the full ownership stayed in a family holding company vehicle, they would have a present-day $22 billion fortune arising from great-grandpa’s decision, as the Dr. Pepper name spread throughout the United States. But it wasn’t to be. He sold all intellectual property rights to his formula to Morrison and Lazenby, who formed a venture that was 80% owned by Morrison and 20% owned by Lazenby that was called Artesian Manufacturing & Bottling Company. As the company began to dominate Dallas and wanted to grow beyond its one-shop roots, Morrison decided that the Waco brand needed a renaming. Back when Morrison was a young man, he used to work for Confederate surgeon Dr. Charles T. Pepper who was stationed at Emory (Pepper was one of only twenty-five physicians at Emory after the Battle of Atlanta who tended to the wounded). As a nod to Charles Pepper and a recognition of the marketing trend of naming soda products “Dr.” in an effort to conjure up images of healing powers, Morrison renamed the product Dr. Pepper with the hope of turning it into a regional powerhouse throughout the South. Morrison sent Lazenby to the 1904 World’s Fair in St. Louis, Missouri to introduce the product to the rest of the world. There was one problem—foreigners had no appreciation for the concept of drinking a pure cola, especially when the advertising was partially couched in medicinal terms. It would be like going to a party and seeing someone on the couch downing an entire Pepto-Bismol. Lazenby, thinking quickly, gave Dr. Pepper beverages to the American visitors and struck a deal with some ice cream vendors to mix some Dr. Pepper in it as a Dr. Pepper float. The result? Almost $500,000 in 1904 capital, or $25 million in today’s dollars, came back to Texas to fund future growth. Although Dr. Pepper was becoming “the” beverage of Texas and the Roanoke Valley (where Charles Pepper was from, and Morrison chose to expand), it was not outshining Coca-Cola. While Coca-Cola was launching deals with bottlers that spurred on production, advertising heavily with Major League Baseball stars like the Georgia Peach himself Ty Cobb, and using attractive women in advertisements to sell the product, Dr. Pepper chose to keep its growth in house, advertised cautiously using matronly women touting the product as a headache cure (due to the caffeine), and was dogged by a nasty rumor in which critics claimed that Dr. Pepper contained prune juice causing laxative effects (when, in reality, it was again the caffeine). Nevertheless, the bronze medal of not rising as nationally as Coca-Cola and Pepsi was nothing to lament. Early investors in Dr. Pepper compounded their wealth at 23% between 1904 and 1951, which is why everyone should have at least a small appreciation for small businesses—the transition from small to regional player can make a lot of money in the meantime, turning investments of a few thousand dollars into millions. The 1940s through 1970s were marked by its fractious relationship with Coca-Cola. In the 1950s, Coca-Cola was being sold for a nickel in Texas, gaining ground on Dr. Pepper’s stronghold market where it was selling its soda for 8 cents each. This caused a five-year lawsuit in which Dr. Pepper raised a restraint on trade lawsuit because Coca-Cola prohibited Texas retailers from selling its beverage above a nickel, essentially deciding that retailers would have to sell Coca-Cola products at cost (i.e. retailers were paying Coca-Cola a nickel for the right to sell a product, and Coca-Cola was trying to mandate a contract term that prohibited its product for being sold for any more money than that). This lawsuit ended with Coca-Cola trying to buy Dr. Pepper, and as part of its takeover efforts, Coca-Cola relented on the requirement that Texas gas stations and general stores couldn’t sell Coke for over a nickel. However, the Federal Trade Commission mounted a fierce resistance to the takeover arrangement because a post-merger Coke and Dr. Pepper would control 80% of the American cola market (and bizarrely, the FTC also made an argument in the alternative that “pepper-flavored colas” were different than “general colas” and Coke would control 100% of the pepper-flavored cola market if the deal were permitted to consummate). The good doctor Samuel Johnson once said that some men are wired in such a way that, if they cannot have something, they desire to destroy it so that no one can have it all. Apparently that applied to 1972 Coca-Cola executives as well. After the Dr. Pepper-Coca-Cola merger fell through, Coca-Cola decided to launch a brand called “Peppo” with the aim of destroying Dr. Pepper’s presence. Dr. Pepper sued for trademark infringement. Coca-Cola changed the name to Dr. Pibb. Dr. Pepper sued again for trademark infringement. Coca-Cola changed the name to Mr. Pibb. Dr. Pepper sued again for trademark infringement. Coca-Cola won and got to keep the Mr. Pibb name. By 1982, Ted Forstmann of Forstmann Little led an investment group that bought out Dr. Pepper and rolled out a national bottling infrastructure in which Coca-Cola would get to collect a percentage of all Dr. Peppers sold in its network areas. After orchestrating a merger with 7UP, Forstmann Little sold the international distribution rights of Dr. Pepper to Coca-Cola and sold the international distribution rights of 7UP to PepsiCo (this is why Dr. Pepper is generally only focused on U.S. growth and always acquires other beverage brands in the United States; it largely sold away the right to profit internationally from its own intellectual property). It did help make Ted Forstmann an incredibly rich man. By 1986, Dr. Pepper delivered a twelve-fold increase in value; Ted Forstmann’s $8 million investment in Dr. Pepper became worth close to $100 million. It is interesting to me that Forstmann built such a legacy for himself by criticizing KKR and the rise of junk-bonds (he’s the one who coined the term junk bonds and the phrase “barbarians at the gate” to describe the NJR Nabisco takeover), but yet, found another way to wring out value by extinguished untapped safety reserves in selling the various international property rights that Dr. Pepper owned. The Dr. Pepper deal-making introduced Forstmann to Lord Jacob Rothschild who, in turn, introduced Forstmann to Princess Diana and the alleged romance that followed. While all of these stories of intrigue were playing out in the background, one truth remained: Anyone with an ownership interest in the Dr. Pepper portfolio of beverages continued to get very, very rich. The famed Wharton professor Jeremy Siegel noted that Dr. Pepper was one of the top twenty businesses in the entire United States between 1956 and 2003—if someone bought Dr. Pepper stock in 1956, took the cash during the Forstmann Little buyout, and sat on that cash until it became publicly traded again, a mere $10,000 investment would have grown into almost $57 million. Selling Texans and people in the Roanoke Valley soda pop day in and day out means profit day in and day out, and over half a century, it turns into something enormous. I was thinking about all of this when the news broke on January 29, 2018 that Keurig, controlled by the Reimann family through their family investment vehicle JAB Holdings, announced that it was buying out Dr. Pepper in a mostly cash buyout that pays out $103.75 per share (structured as a cash dividend rather than merger for tax savings) and permits existing shareholders to retain a 13% overall interest in the firm. In other words, if you own 100 shares of Dr. Pepper, the effect of the transaction is that you will have 13 shares of Keurig-Dr. Pepper that paid out a one-time dividend of $10,375). In my view, it is a brilliant move by the Reimann family. You can’t name one hundred companies with a track record back to the 1800s that has a better record of wealth creation than Dr. Pepper. It is an “all-weather” company in that it keeps chugging out profits year after year, in boom times and recessions. When the world fell apart in 2008 and 2009, Dr. Pepper’s annual profits actually grew modestly from $470 million to $503 million. Your decision to drink a soda or not is not particularly correlated to your recent economic situation (though, in the past ten years, affluent Americans have begun to reject soda in droves, as 4% of the United States consists of millionaire households but that same demographic only consists 1% of the overall soda market, down from consuming 2% of the soda market when 3% of U.S. households were millionaires in 1998). The Reimanns have also bought Dr. Pepper at a time when the traditional control premium for taking over a business has been offset by the U.S. tax cut. So Dr. Pepper went from $90 to $120 or so by the time this deal closes—roughly a 33% premium. This move is occurring at the same that U.S. taxes are being cut from 35% to 21%, or a 40% cut. Nearly all of that flows to Dr. Pepper’s current shareholders because it doesn’t own the international rights to its businesses—i.e. well over 90% of Dr. Pepper’s profits originate in the United States, meaning that it is a business that fully participates in the effects of the tax cut. The magnitude of Dr. Pepper’s expected benefit from the tax cut exceeds the premium that the Reimann family had to pay to get their hands on this jewel. Dr. Pepper is a prince that has never quite gotten its due. It’s created enormous fortune, but because the company has been private and public throughout its history, it doesn’t have that clean data point like Coca-Cola can market by saying, “If you bought 1 share of Coca-Cola at the 1919 IPO, you’d have $15 million today.” Dr. Pepper’s statistics are like that, too, but it contains periods of interruption when the company was privatized. It also never quite established the gold-plated dividend history that Coca-Cola or PepsiCo have done because of debt and the fact that its private owners were relying on the cash flows for their own ends (and, also, don’t forget Dr. Pepper is only a 1/10th the size of Coca-Cola, so it has more room for accretive acquisitions that were more attractive uses of cash flows than paying out dividends to existing shareholders). I was struck the simplicity of the business model. Some pharmacist in post-Civil War Waco, TX was fooling around with soda flavorings and came upon a sugar and caffeine concoction that caught the attention of the locals with a sweet tooth. Because it doesn’t leave a permanent aftertaste in your mouth—like, say, fried chicken would—you can come back day in and day in and have another Dr. Pepper. That, in turn, has meant that whoever has an ownership claim on this beverage receives a cut of the cash, over and over again. It also tells me something about human nature that, despite being a wonderful business, its owners have perpetually played gin rummy with it. It could have been the Alderton or Morrison families, or the heirs of Teddy Forstmann, that owned this $22 billion empire, but yet, there is something about the Reimann family that enables them to recognize the good thing in this beverage gem that its former owners with the best position to assess it could not. One of my favorite stories involving Dr. Pepper concerns William “Bill” Kloster, a Texas mixer and bottler of Dr. Pepper who gained notoriety in the early 1990s for refusing to go along with the Big Soda trend of replacing sugar in soda with high fructose corn syrup as the price of American sugar rose in the 1980s. Kloster, believing that Texas customers shouldn’t be drinking lower-quality soda than that consumed in Mexico, refused to relent. His Dublin Dr. Pepper Bottling Company continued to use real sugar and created a cult sensation appropriately named “Dublin Dr. Pepper” that customers sought out as they wanted the real thing. Retailers would try to strike out-of-territory deals with Kloster for the sale of Dublin “DP” because it was a fashionable gas station or retail store option to give customers. Unfortunately, Dublin DP came to an end in 2012, as Dr. Pepper corporate and bottlers sued Dublin Dr. Pepper Bottling for trademark dilution (by using a more expensive ingredient, Ha!) and for breach of its franchise contract for selling Dublin DP outside of its approved territory. While the breach of contract claim was legally merited, it was obtuse of everyone else involved to fail to recognize the sustained allure of traditional formulas and resistance to product deterioration. The good news is that 13% of this company remains publicly traded. If you are an existing shareholder, there is no rule that you cannot take the one-time cash infusion from the merger and reinvest it into the combined Keurig Dr. Pepper. If you are a prospective shareholder, there is nothing to stop you from buying shares now or buying some after the merger (I’m not your tax advisor, but in most scenarios, I would imagine it would be better to wait to buy shares so as to avoid paying a dividend tax at the short term rate, but if you are considering a purchase in a tax-sheltered account and expect the stock to appreciate in the short term, you might reach a different conclusion). Someone who gets their hands on a few hundred, a few thousand, or even tens of thousands of Keurig Dr. Pepper shares will likely be more than satisfied with the harvest they reap a few decades from now. The regular purchase of the product, the adequate advertising budget, the loyal followings of daily customers in Virginia and Texas especially, and its merger into a family-controlled vehicle with a track record of success likely means that the final chapters of Dr. Pepper’s wealth creation story have not yet been written.